Yes, it’s July again, and that means it is time for the National Shooting Championships at Camp Perry. The events kick off tomorrow with the start of the 5-day Pistol competition. The NRA National Outdoor Rifle & Pistol Championships are fired at Camp Perry, OH, during July and August. Firing dates for 2008: Pistol – July 8-12; Smallbore 3-Position – July 16-19; Smallbore Prone – July 20-24; High Power Rifle – Aug 4-8; High Power Long Range – Aug 9-13. If you wish to compete at Camp Perry in an event held later this summer, you can apply via the Camp Perry Online Entry Page. Complete competition results are updated regularly on the NRA website. CLICK HERE for Camp Perry Match Results. 1. Big money is at stake. Over $200,000 in cash/gift card prizes will be awarded. The cash prizes or Visa award cards replace award points in the Grand Aggregate Championships. 2. A Team Match has been added to the Long-Range High Power segment of competition (August 4-8). Four-person teams will compete using a Palma Course of Fire. This was a popular addition — the Team Match roster is already full. 3. A new target will be used for 3-position shooters in the National Smallbore Rifle Championships. Share the post "Camp Perry National Championships Commence July 8"
The 2008 USA Shooting National Championships for Rifle/Pistol came to a close today with Matt Emmons earning his third national title of the competition, taking first place in the Men’s 3-Position Rifle event. Matt won an Olympic Gold Medal in 2004 and will be on the 2008 U.S. Olympic Team going to China. Matt is married to Czech Shooter Katerina Kurkova, 2004 Olympic Bronze Medalist and 2002 World Champion. Emmons (Browns Mills, N.J.), finished on top with final of 101.1 and a total score of 2455.1. Earlier in the competition, Emmons also claimed the Men’s Air Rifle and Men’s 3 Position Rifle titles. 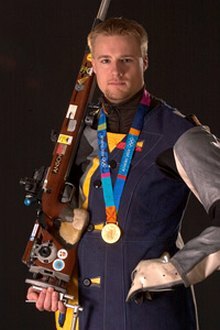 U.S. Army Marksmanship Unit (USAMU) member and 1996 Olympian Eric Uptagrafft (Spokane, Wash) took second place with a total score of 2437.1 and USAMU member Michael McPhail (Darlington, Wis.) finished in third place with 2435.8. The 2008 USA Shooting National Championships for Rifle and Pistol were held at Ft. Benning’s International Shooting Complex, home of the USAMU. Share the post "Matt Emmons Wins Big at Nationals"